TAIPEI – Before getting too carried away with Taiwan’s elevated status under a Donald Trump presidency, President Tsai Ing-wen might want to check her bank balance. Trump’s suggestion that the “one China” principle – that Taiwan is a part of China – was up for negotiation has already prompted sabre-rattling from Chinese state media and some in the military establishment. And even if the United States – Taiwan’s sole arms supplier – agrees to sell the advanced weaponry the island needs to deter a Chinese attack, Taipei will struggle to pay the bill, government advisers and experts say. Despite that threat, Taiwan has spent less than 2 percent of its half-a-trillion dollar economy on its defence needs in recent years, leaving it woefully unable to match a free-spending China militarily. US-based think tank the Rand Corporation said in a research report last year the United States would find it far more challenging to come to Taiwan’s aid in the event of an attack now compared to two decades ago, due to rapid advances in Chinese capabilities. In 1996, only two US air wings would have been need to achieve air superiority at the outset of a conflict, but by 2017 that rises to 30, the report said. Selling arms might be more palatable, and there is certainly a need. Two of Taiwan’s four submarines date to World War Two, while the two other Dutch-built boats have been in service for nearly 30 years. But Chieh estimates submarines would cost Taiwan more than $2 billion (1.6 billion pounds) each, requiring a special budget fundraising via government bonds – a more expensive prospect in a rising interest rate environment. Buying big-ticket items like subs would also be a tough sell at home because Tsai has made developing an indigenous defence industry a key policy plank to create jobs and pump up the sluggish economy, currently growing at less than 2 percent. Taiwan has previously developed its own missiles and also manufactured over 100 of its own fighter jets in the 1990s before the programme withered. The navy has just begun programmes to build a few small warships, and next on Taiwan’s list are submarines and advanced jet trainers. 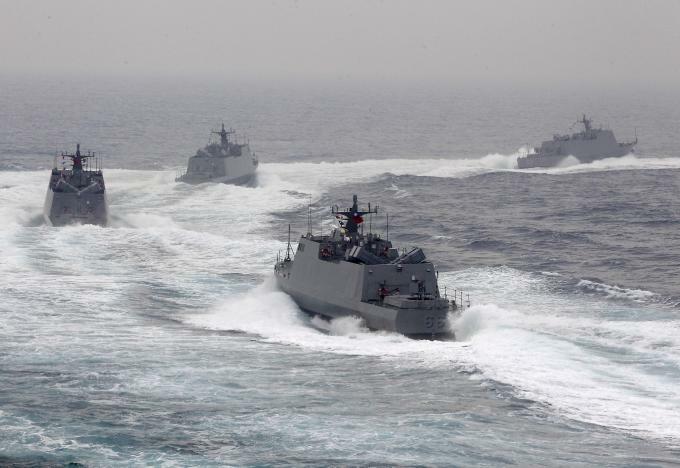 But critics say it will take years to build a battle-ready fleet, costs would likely be higher than buying second-hand equipment and there is almost no export market to sustain programmes for Taiwanese defence goods. Taiwan’s reliance on the United States is therefore key. “Beijing knows that we have obligations to help Taiwan defend itself and resist coercion, as enshrined in the Taiwan Relations Act, and that we make decisions about our defence relationship with Taiwan based on the threat that China poses,” said Daniel Blumenthal, director of Asian Studies at the American Enterprise Institute, and a former US defence official. Trump’s campaign rhetoric, however, indicated he may be less likely to go to war over someone else’s defence while recent comments suggest Taiwan may be a pawn in his trade negotiations with China. Madeleine Bordallo, a member of the US House of Representatives Armed Services Committee, says throwing China a “curve ball” will make Beijing think twice about issues such as Taiwan.